As seen in MILLENNIUM #2, Batman is caught unawares by Commissioner Gordon’s betrayal as he pistol whips him and throws him out of the window. Batman is able to swing around to another window and heads back to the office to confront Gordon whom he now believes to be a Manhunter, but finds him gone. Over-hearing a conversation about Floronic Man insisting he be released to take part in the Millennium event, Batman returns to the Batcave after conducting surveillance at Arkham Asylum where the Floronic Man is held. 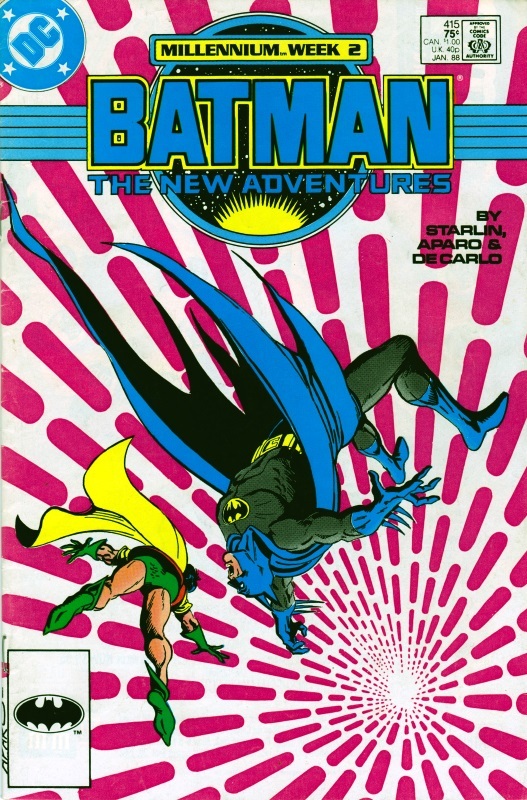 He and Robin smuggle themselves in to Arkham and confront Gordon who is revealed to be a Manhunter android. With the robot destroyed, Batman takes its head back to the Batcave and discovers the real Gordon is in Louisiana. After confronting Lieutenant Fisher in MILLENNIUM #2, Blue Beetle is accosted by Overthrow who reveals he is Beetle’s Manhunter. Managing to escape, he reports to the Justice League International who have received word that one of The Chosen, Salima Baranizar of Iran is in trouble. By the time Beetle heads to Iran in disguise, Salima has been arrested for blasphemy. 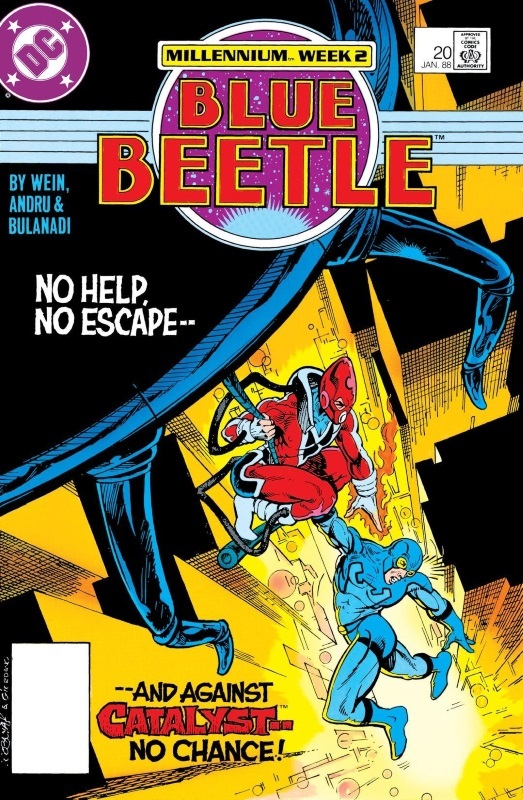 Beetle sets about freeing her but is distracted by the criminal Catalyst who thinks he is there to stop him. Escaping Catalyst, Beetle frees Salima and tries to convince her that she needs to return to America with him but she refuses, rushing out into the street and proclaiming that she has been chosen by Allah to lead her people into the Millennium. Incensed, the people of the city stone her to death, leaving Beetle to leave the country wondering if the Guardian’s plan is now ruined. As most of the Legionnaires use their gym, Laurel Kent, a relatively recent member of the team, heads to the multi-lab to access the computers but is interrupted by Brainiac 5. When he attempts to find out what she’s doing, Laurel attacks which quickly brings the other members of the Legion. Outnumbered, Laurel takes what information she has gathered from the computers and escapes. After working out what information Laurel stole, Brainiac 5 and the others follow her to a Buddhist temple in the Himalayas. There they are attacked by androids before fighting their way through to another secret temple where the find Laurel revealed as a Manhunter android who has been waiting a thousand years as a contingency plan in case the Guardian’s plan to produce a race of immortals came to fruition here in the 30th century. Having used the computer information to find the likely suspects, she destroys the temple, hoping to kill the Legionnaires as well. 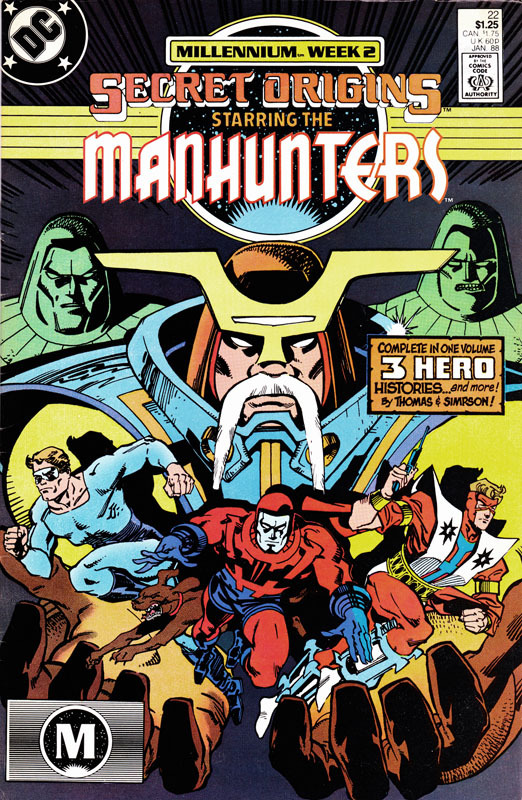 At a meeting of Manhunters that, presumably, takes place before MILLENNIUM #1, the Grandmaster, leader of the Manhunters, tells of the origins of the group, from the creation of the androids by the Guardians of the Universe, their revolt against their masters, and their discovery of Earth and their plan to hide among its people. The first costumed hero to take up the name Manhunter, Dan Richards, is shown to have been recruited by the Grandmaster himself, without being told the true meaning of the name or the group. Shortly after, they recruited Paul Kirk as a Manhunter again without revealing the truth. Richards retired years later and Kirk was killed in combat, and another man, Mark Shaw, took up the name, knowing nothing about the real group. He took on the Justice League in order to capture Hal Jordan, but helped them when Jordan was shown to be innocent of destroying a world and the Manhunters were behind his framing. Corrupted by a taste of power, Shaw turned to villainy and was arrested. The Grandmaster then tells of capturing Harbinger’s History of the DCU orb (as mentioned in MILLENNIUM #2) which gave them the information to put agents next to many super-heroes. 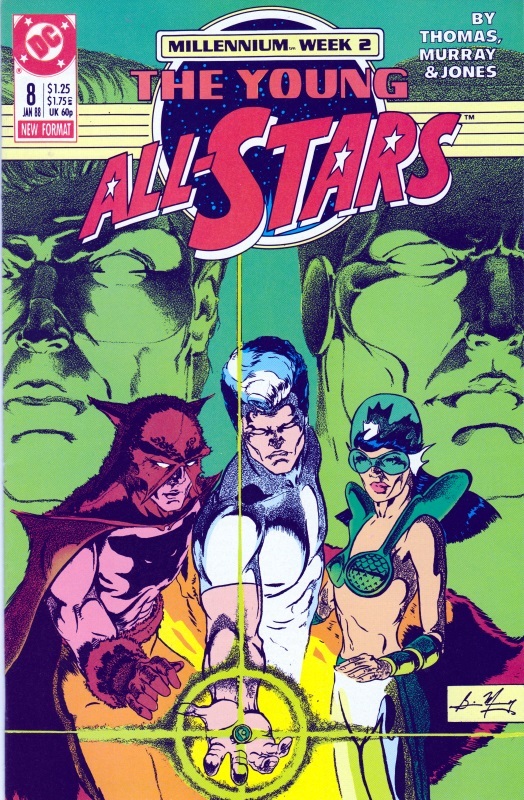 Dan Richards, the first hero to call himself Manhunter, even recruited his grand-daughter Marcie Cooper into the group, though they suspect him of harbouring doubts about the Manhunters’ true mission. Something of a Red Sky Crossover issue, all but the last four pages of SUPERMAN #13 deal with Superman’s attempts to capture the Toyman before he kills Lex Luthor. Of those last four pages, two of them faithfully replicate the first three pages of MILLENNIUM #2 as Lana Lang confronts Clark Kent in the Daily Planet and reveals herself to be a Manhunter agent. In MILLENNIUM #2, the scene ended with Lana tearing open Clark’s shirt to reveal his Superman outfit; here we see that he’s not wearing it. This confuses Lana and she jumps out of a window, shedding her clothes and flying off dressed as a Manhunter. Superman follows her and finds she is about to land in Smallville. 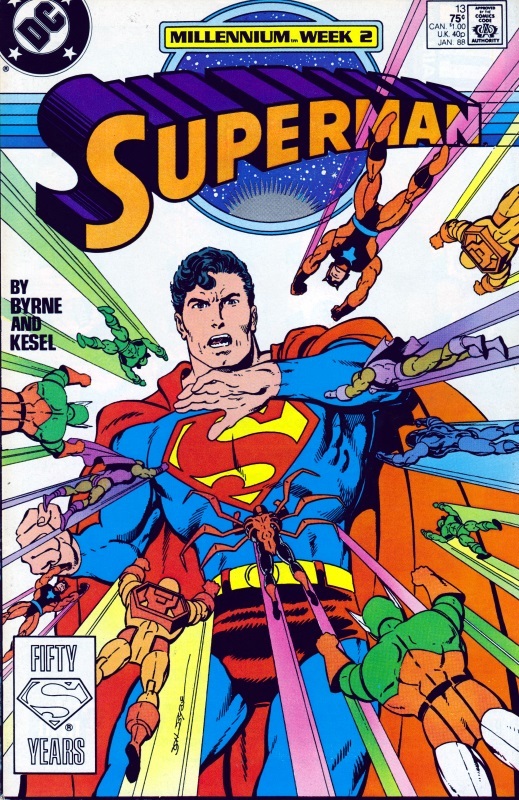 This is continued in ADVENTURES OF SUPERMAN #436 which is dealt with in Crossovers Week 3. As seen in SECRET ORIGINS #22 above, the Grandmaster recruited both Dan Richards and Paul Kirk to be Manhunters in the 1940s and he brings them together for the first time here and, feigning a resigned sorrow, tells them that they must destroy the Green Lantern, Alan Scott. The Manhunters, along with Scott’s friend “Doiby” Dickles, contact the Young All-Stars and show them footage of Alan Scott attacking an American military camp and escaping with a Japanese prisoner. After the heroes leave to find Scott on the Aleutian Islands off Alaska, Dickles is revealed to be a Manhunter android that simply dissolves, its work completed. On the Aleutian Island, the You All-Stars find and attack Green Lantern but are defeated by him; though he has a brief moment of lucidity during the battle, he is clearly being mind-controlled and flies off, leaving the young heroes unconscious.